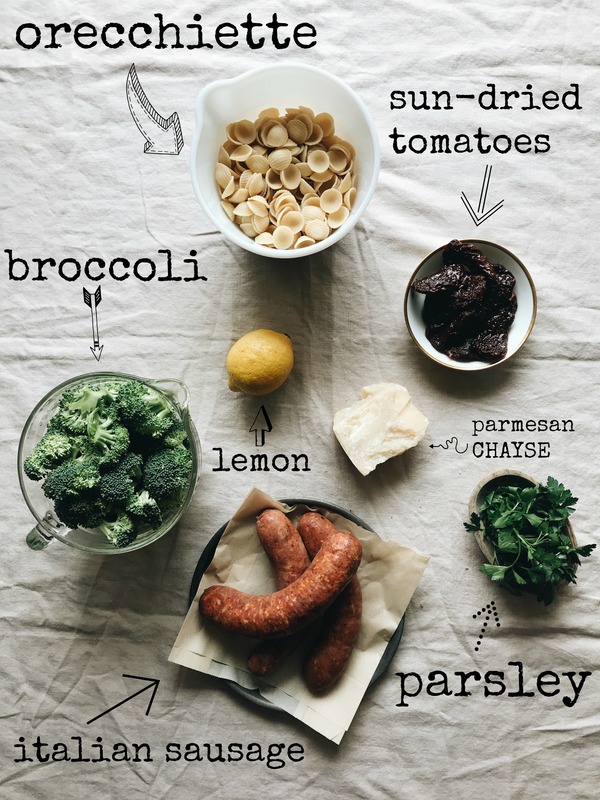 Almost April and this is my first sausage pasta recipe for you? WHAT IS THIS RIFF RAFF. I have a feeling you’ll forgive me. This is one of those recipes that takes little to zero brain work. You’ve done it all before. 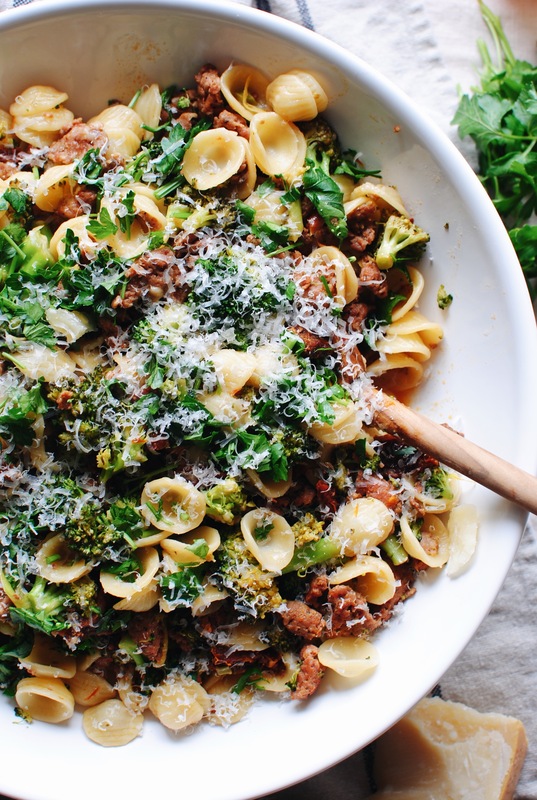 There’s no real mystery, except maybe the sun-dried tomatoes + broccoli. Have you tried that? Oh, honey child. Also, I’m only 80% sure I spelled orechliwerlweihtet right. I can’t ever remember! That word always stumps me. And even when I look it up to double check I’m like ARE YOU SURE, INTERFLEX? It doesn’t seem right. Two r’s? Two cc’s? Two hh’s? I DON’T KNOW. It doesn’t feel right. Never does. You’re like, you don’t feel right. In the head. 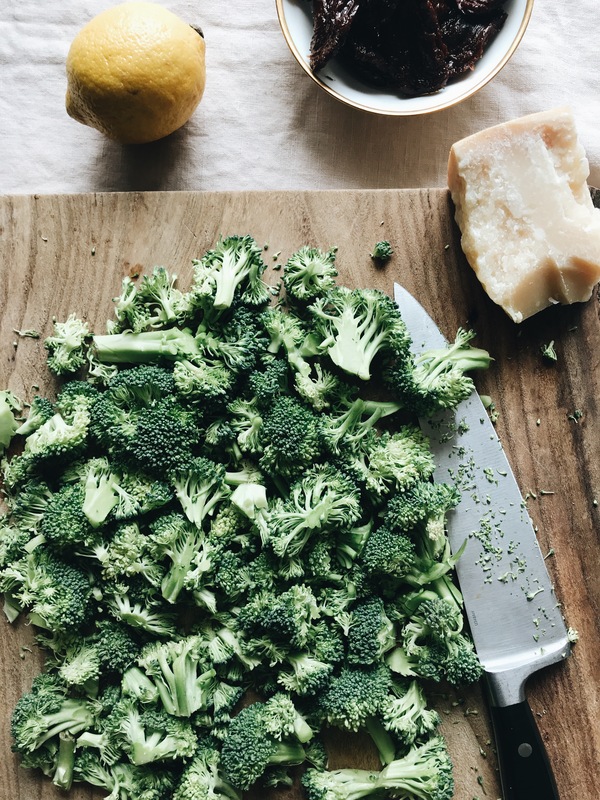 Oh hey, chop that broccoli. You don’t have to get all Halloween on it, just a light chop. Gentle and friendly. It’s okay. 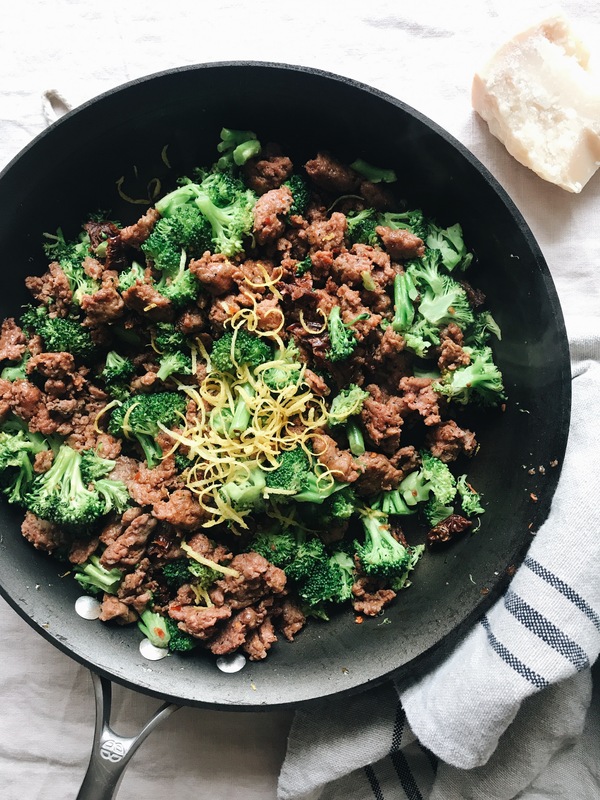 You’ll basically brown your sausage (hot, medium, mild – this is YOUR DAY), and get the broccoli and tomatoes lightly sautéed in der. In the meantime you’ve boiled the oreworiusdjxchverwtwei, and will just transfer it over with about a cupish of pasta water, to make the sauce. The water + lemon juice + existing pan flavorings extravaganza = you doing the Macarena. I do not lie about this. 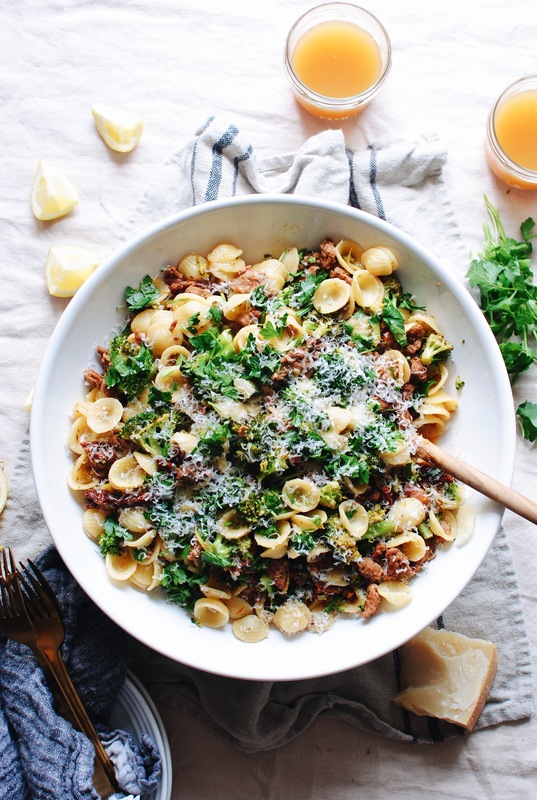 Add some parm, a bit of lemon zest, lots of parsley, pinch of salt and…..
Ridic. It’s so perfect. So much flavor. So much pizzazz. Ohhh you know what, there used to be a little clothing store in my teenage hometown of Hobbs, New Mexico called PIZZAZZ. I never went. You need to make this. I don’t want to get bossy, but I’m prepared to. Comforting, well balanced, all the citrus and cheese. GET IN THAT ALREADY. Brown the sausage in a large skillet, breaking it up with a wooden spoon, until no longer pink. Take the lid off, give it all a good stir, taste and adjust with a little salt if needed. Then garnish with chopped parsley and more cheese. Serve to your face immediately! Should the sun dried tomatoes be just dried in the bag or the kind lacked in oil? This looks amazing!!! Good question! I'll make the edit to clarify - I used the kind in oil! And just sort of brushed the oil off a bit. Hope that helps! Hi there, I'm wondering how long I should boil the oreworiusdjxchverwtwei for the recipe? Just until al dente! Or according to package directions. Usually takes like 8-10 minutes. Hope you enjoy! Forgiven ! :-) Meraviglioso ! Did you use sweet or spicy sausage? Thanks so much, Bev! Love your site and Instagram account. 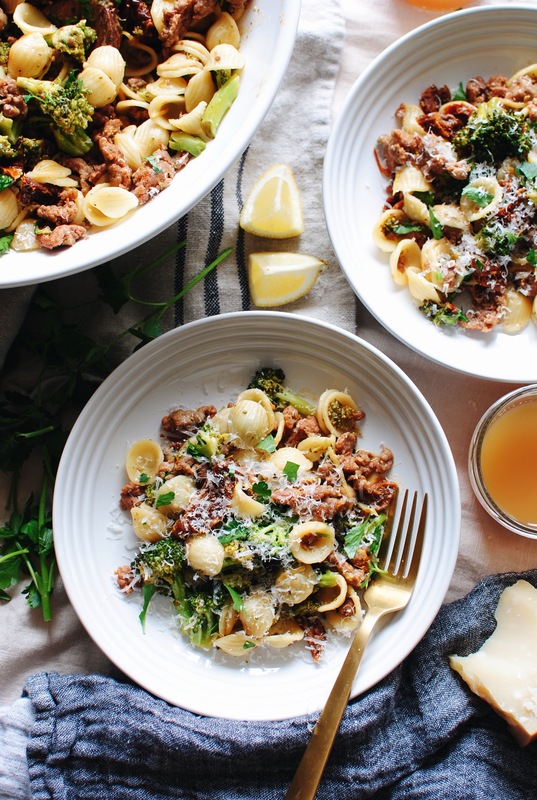 I have made a skinny taste version very similar but totally different and now I see what it lacks: LEMON AND SUN DRIED TOMATOES. I love you. This sounds incredible! I tried a roasted carrot orrrrrrreccccccchiettttttteeee from Cooking Light this week, and I was a little obsessed with it. Pinning this bad boy for later. 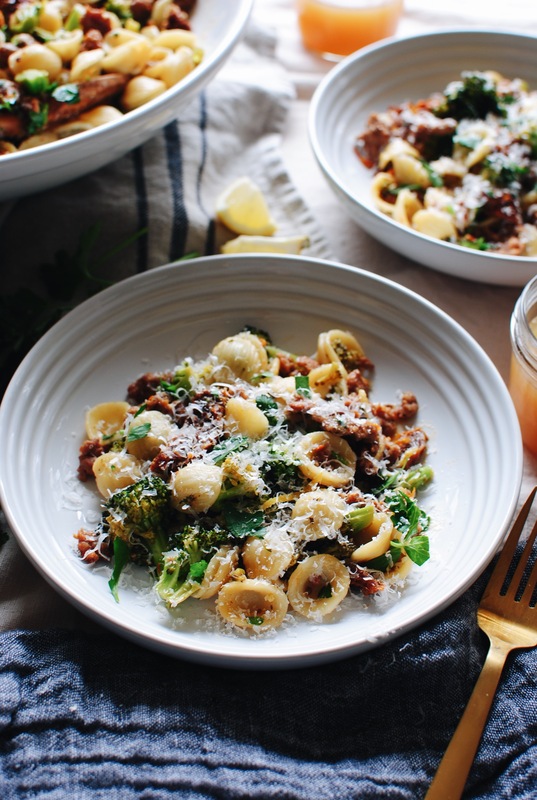 Hi, pasta (oricchiette and others) with sausage and BROOCCOLI RABE is very popular dish in the Providence, RI area. Give the rabe a quick blanch in the pasta water. Mangia! Made this, it was awesome! 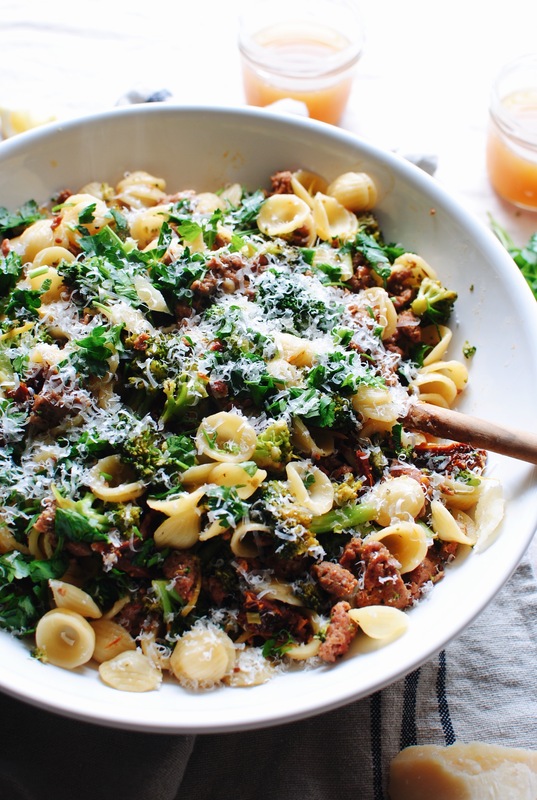 Used the spaghetti I had on hand, but it really would have been better with orecchiette, per the recipe- to match the shape/size of the broccoli.